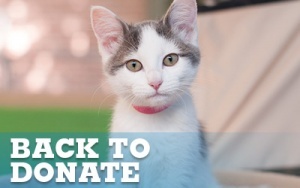 We welcome you to join our Humane Heroes monthly donor family. Monthly contributions provide us with a vital, steady stream of income that directly impacts the lives of 200+ pets in our daily care. Annual Statement of your giving, sent each February. Our quarterly newsletter, Paws for Thought. Humane Heroes e-newsletter, exclusively for our monthly donors. Checking & Savings: The easiest choice that allows continual giving without the need to update expired credit cards. Please complete this form and mail it to the address below. Credit & Debit Cards: Submit your monthly contribution in the giving box above, and complete your payment information. Thank you for supporting Animal Humane New Mexico! If you experience any difficulties making an online donation, or would like more information, please contact Jen Fox, Donor Relations Manager, at 505.938.7913 or [email protected].